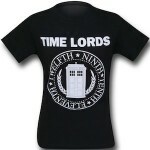 This white kids t-shirt is for the little Doctor Who fans out there. On the t-shirt you can see the famous Doctor Who logo that looks like the Tardis but are actually a “D” and “W” next to each other with a shape on top. Besides that logo it also says Doctor Who in a fun print that does remind me of those classic neon sign only the text is in black so nothing neon there. 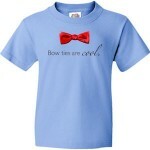 You can get this kids Doctor Who t-shirt in sizes XSmall – XL and it is made from 100% cotton for easy use and soft feel. Come check out this Kids Neon Sign Doctor Who Logo T-Shirt.